Faced with a carton of double cream that was fast approaching its use by date I knew the best way of preserving it was to make ice cream, that way we could eat it at our leisure rather than making a creamy dessert that would need to be finished the same day! So then came the dilemma of which flavour if ice cream to make, well having been to three food fairs recently the one that sprang to mind was ‘salted caramel’, it’s in everything these days and deservedly so. Then wanting a bit of texture in there I decided that chopped up Crunchie bars would be the perfect flavour combination and I wasn’t wrong. As the Salted Caramel Crunchie Ice Cream was coming out of the ice cream machine it was very difficult to resist diving straight in for a portion! My daughter had helped me so I rewarded her with being allowed to scrape the bowl clean whilst I took the spoon – there was no talking we were just swept away in a moment of culinary euphoria. So by dinner time everyone was champing at the bit to have a portion of ice cream for dessert even though I’d wanted to let it freeze fully over night. So bowing to family pressure I served it a bit before it had fully set and as I was about to take my photos my camera decided after a couple of shots to stop working. Ordinarily this wouldn’t phase me but this was ice cream and it was melting fast so I ran up to find another battery as I didn’t know what else to do with a frozen flashing camera. So please excuse the photographs for the slightly melted look but rest assured that it is delicious. The Crunchie pieces aren’t that visible in my shots but they worked so well as a contrast to the smooth dairy salted caramel ice cream and when you hit them it’s just pure pleasure! My hubby said my ice cream was better than Haagen Daaz and my children said it was out of this world too. 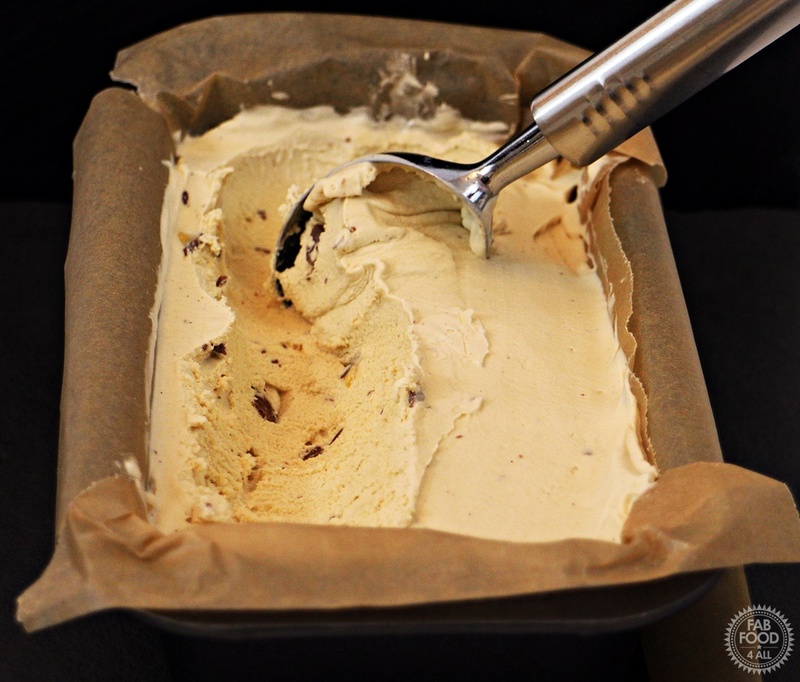 I think my Salted Caramel Crunchie Ice Cream would be the most wonderful treat for a bonfire night party or Christmas for those who don’t like Christmas pudding or serve it with the Christmas pudding – ooh yum! 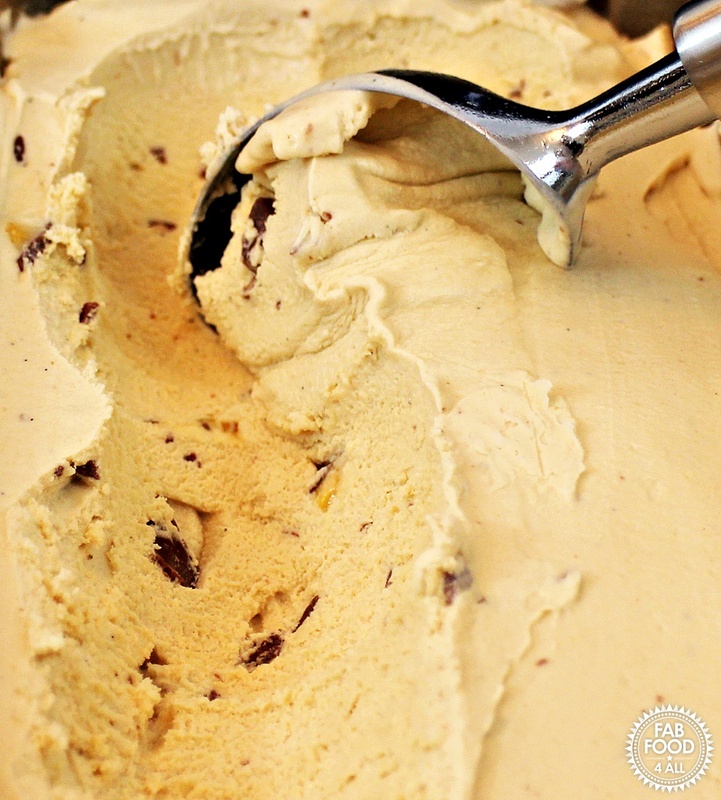 Salted Caramel Crunchie Ice Cream - lush dairy salted caramel ice cream studded with honeycomb and chocolate from the Crunchie bars - just sublime! Place the Muscovado sugar and butter in a pan and heat until melted. Allow to bubble for 1 minute. Add the warm milk, stirring until gently heated through. Beat the eggs and sugar until thoroughly mixed then stir in the warm milk mixture and vanilla paste. Use a sieve to strain the mixture back into the pan. Stir over a low heat until the custard thickens slightly (it mustn't boil or simmer or will curdle). It should just coat the back of a spoon. Cool the custard by pouring it into a bowl and place it in a larger bowl, a third full of iced water – this takes about 20 minutes. Meanwhile whisk the double cream lightly (until forms floppy peaks, you don't want stiff cream). Place in the fridge until custard has cooled. Once the custard has cooled mix in the cream and salt flakes and put in the fridge for at least 10 minutes. Chop up the Crunchie bars into small nuggets (if you do this any earlier they just start to melt). Pour the ice cream mixture into an ice cream maker, switch on and then pour the Crunchie pieces down the shoot in order to mix them in. Once the ice cream is ready, spoon it into a suitable container (if you can wait) and allow it to freeze fully for a few hours before serving. Fun Fact: Salted caramel originates from French and American chefs and Haagan Dazs introduced their Salted Caramel Ice Cream in the US in 2008 then six months later Starbucks started selling their Salted Caramel Hot chocolate over there? The rest is history as they say! This looks so good! 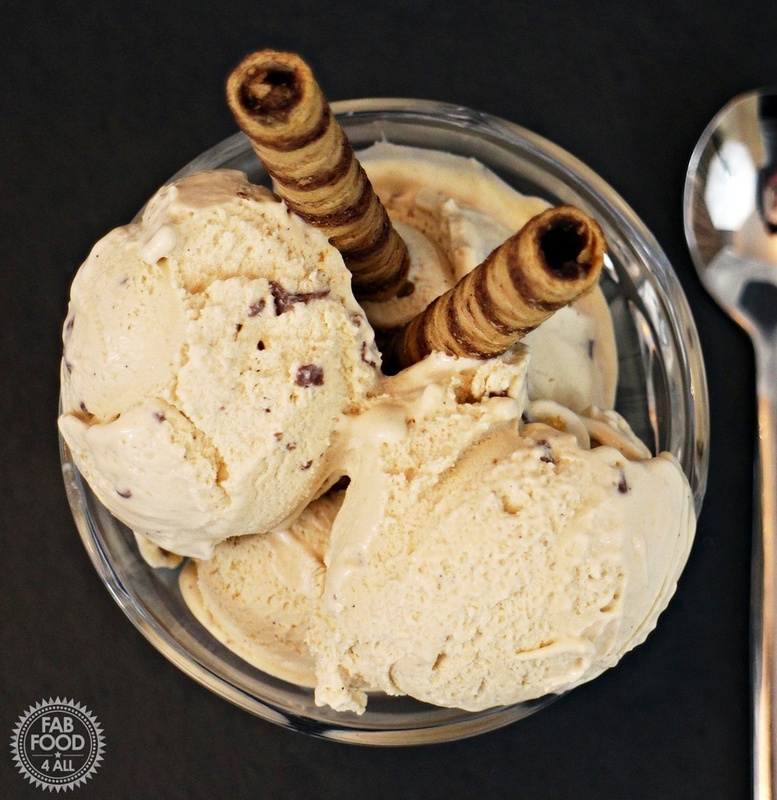 Using muscovado sugar is a perfect way to carry the flavour of the honeycomb through the rest of the ice cream. Salted Caramel is one of my favourite flavours in chocolate, so I could love to have a go at making this.